Upon moving to Philadelphia to attend the MBA program at the Wharton School, Jerry Lin, Kristian von Rickenbach, and Adam Tishman each underwent an almost Goldilocks-and-the-Three-Bears-style adventure in looking for the perfect mattress. The only problem was, none of the methods they attempted — whether paying top dollar at a local store, buying online, or getting one on the cheap at a huge furniture chain — proved to be just right. That’s why the trio decided to found Helix Sleep, a mattress company that will send you a mattress for under $1,000, with free shipping and a 100-day trial period. If it sounds familiar, it’s because Leesa and Casper are both offering a similar service. Helix is different because shoppers fill out a survey and the company builds the mattress to their specifications, von Rickenbach tells Digital Trends. 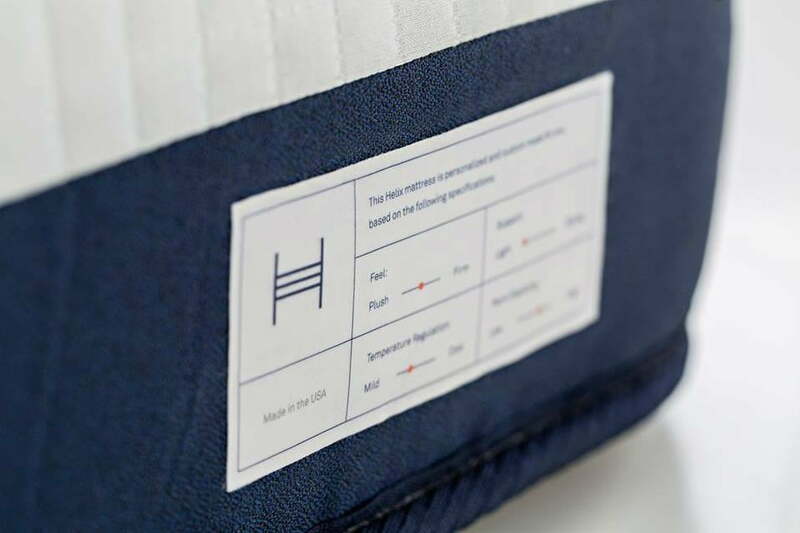 While the firm’s competitors make mattress shopping quick and hassle-free — by offering a one-size-fits-all approach and hassle-free returns — Helix wants to do the same thing, but with a personalized final product. They’re finding a lot of traction with couples, he says, because for an extra $100, the mattress can be split in two, with the left side built for a side-sleeper who’s always cold and the right customized for someone who sleeps on his stomach and kicks off the covers in the middle of the night due to overheating. Roughly five minutes and a slew of unavoidably personal questions later (the site wants to know your height, your weight, your body type, and whether you have restless leg syndrome), the company’s algorithm has figured out the perfect mattress for you. Made out of a mix of latex, high-density polyurethane, and microcoils, the structure of the mattress will depend on how you answered those questions. “We can play around with the layers of the mattress — including the thickness, the density, the materials, and the order of each of those materials — in order to optimize the mattress over four key metrics,” says Tishman; the metrics are feel, support, temperature regulation, and point elasticity, which basically means its ability to support different parts of the body depending on your sleeping position. What if you’d rather not pay the extra $100 and just want a mattress that works for both you and your partner? “We don’t just create an average person and accommodate to that,” says von Rickenbach. “We have developed an algorithm which figures out the key features for each person, and it’s able to cater to those.” If you need extra support thanks to your side-sleeping, it might rearrange the layers to prioritize that over your partner’s preference for more airflow to the mattress. A non-split queen starts at $900, and Helix will deliver it in seven to ten days. And if the algorithm somehow missed the mark, you’ll have 100 days to get a refund, and Helix’s shipping partner will arrange for it to be donated or recycled.